Yesterday I was doing a little blog housekeeping (blogkeeping? 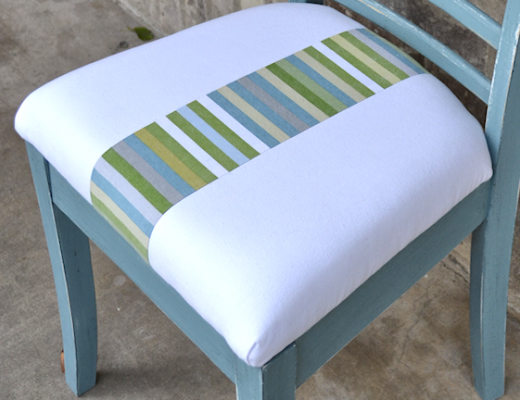 ), and realized that a handful of my older DIY projects were missing from the DIY Projects Gallery. I came to realize that some of them didn’t survive the switch to WordPress. So this is a re-post of one of my very first DIY projects that I did for Addicted 2 Decorating. Enjoy! Vintage world globes have such wonderful charm and character, and while the geographical information may be completely outdated, the shape, colors, and textures can add beauty to any home. This whimsical world globe pendant light would be a wonderful addition to a home office, a modern living room, or an explorer-themed child’s room. Very sharp small serrated knife. 1. Using your serrated knife, cut around the bottom axis of the globe so that you can remove the globe from the metal stand. This cut line does not have to be straight or neat. It’s simply a means to remove the globe from the stand. 2. 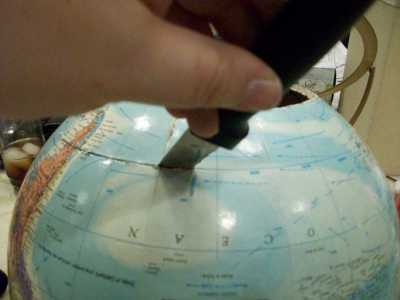 Once the globe is removed from the stand, select a latitude line on the globe, and cut around the entire globe with your serrated knife. Try to cut as straight and evenly as possible, as this will be the bottom edge of your light. 3. Using the light socket on your pendant light cord as a template, trace around the socket on the top of the globe, and then use your serrated knife to cut the small hole for the cord. 4. 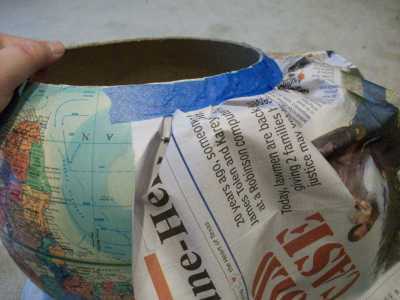 Using painter’s tape and newspapers, tape around the bottom edge of the globe, and completely cover the outside of the globe. 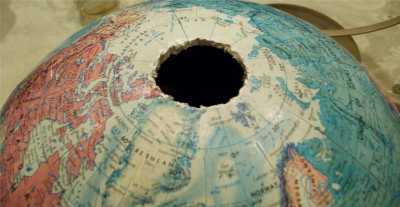 Also use a bit of painter’s tape to cover the small hole in the top of the globe. 5. Using white spray paint, completely coat the inside of the globe. You may choose to use a spray primer first, which helps with the coverage of the spray paint. I always use a primer before using a spray paint. 6. 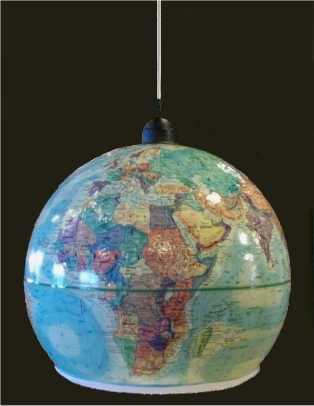 Once the paint is dry, use a glossy clear coat spray and completely coat the inside of your globe. 7. 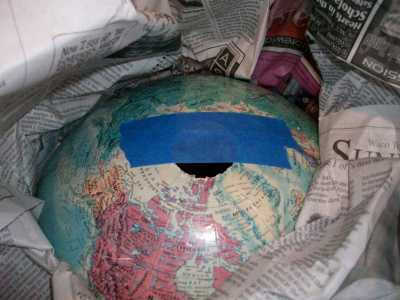 Remove tape and paper from globe and spray the outside of the globe with two layers of clear glossy spray. 7. 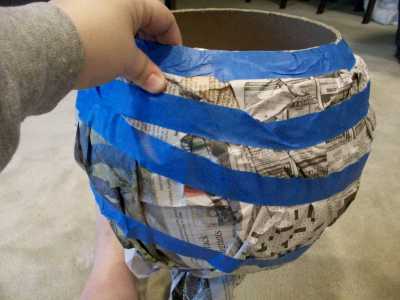 When the paint is completely dry, use your hot glue gun to adhere the bias tape to the bottom edge of the globe. 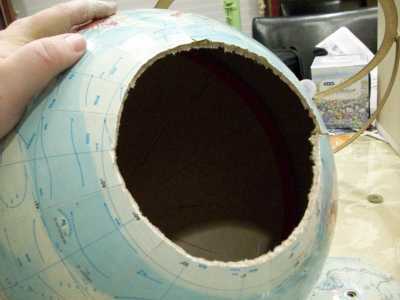 Be sure to maintain a very straight line with the bias tape on the outside of the globe, and then wrap the tape to the inside of the globe and glue. 8. 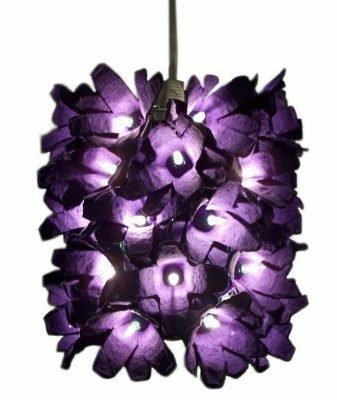 Attach the pendant light cord through the top hole, add your compact fluorescent light bulb, hang your light, and enjoy! Be certain to use only a low temp bulb (e.g., CFL) with this light. A regular incandescent bulb will get too hot. Be very careful when removing painter’s tape from your globe. Paint may lift color from very old globes. Previous Post Out of Curiosity: Reclaimed Wood & Pallet Projects? This is a wonderful idea. A person could also use star globes, or even pinatas, in this way. Crazy! I was just thinking last night about how I was going to use a globe for my little boy’s bedroom lighting and here was this post in my reader. Thanks for sharing today! What a brilliant idea! Love it! Cool, why don’t you convert this into an instructo graphic and pin it on Pinterest? Great idea! Nice! I’m bookmarking this one for later – I happen to have an old out-dated globe that I’ve never felt right getting rid of – now a neat project for it in the wings! I made my son’s childhood globe into 2 lamps, hanging at each end of the sofa. I painted the inside a bronze-orange (one of the colors on the map) and trimmed out the bottom edges with copper metal strapping (used for holding copper pipes in place along a long feed). Everyone who comes into the room comments on the clever beauty of these lamps, and they cost me less than $15 ! One thing for those contemplating this project: I found a large metal disc at the top and bottom of the globe, at the point where they are attached to the globe stand. They were larger than the opening I needed for the IKEA pendant cord, so I had to slice the cardboard lining from the inside (so as not to damage the map decal) in order to remove the discs, and then I could cut the holes to fit the pendant lamps. Before you rush into destroying a perfectly good globe for this project please be aware that vintage globes are a highly collectible item and some can be worth quite a tidy sum. Step 1 should be to do a little research to try and determine whether your globe is more valuable as it is rather than as a novelty lamp!! !